Multivitamins are sold over the counter and may include herbal supplements or minerals. Although they aren't considered a medication, multivitamins may cause side effects such as nausea and stomach upset. Vitamin supplements are not regulated by the FDA and as such have not been deeply studied; no list of the side effects from taking them accompanies the packaging. Some people may experience headaches when using multivitamins, or if too many have been taken. Consult with your physician before taking a multivitamin supplement. Vitamins and minerals are contained in food and eating a balanced diet provides you with all the essential vitamins and minerals you need. Due to vitamin deficiencies -- during pregnancy and aging, for instance -- it may become necessary to take multivitamin tablets. These supplements are sold over the counter and are also available by prescription for people who do not get enough vitamins from diet alone. Multivitamins contain a combination of essential minerals such as iron, calcium, magnesium and biotin; along with fat-soluble vitamins A through D and water-soluble vitamins B complex and vitamin C. Multivitamins contain the recommended daily allowance of each vitamin and mineral, although dosages may differ depending on the formula. There are multivitamins called prenatal vitamins specifically designed for women to take during pregnancy. Women entering menopause and adults over the age of 50 also have multivitamins designed with their needs in mind. 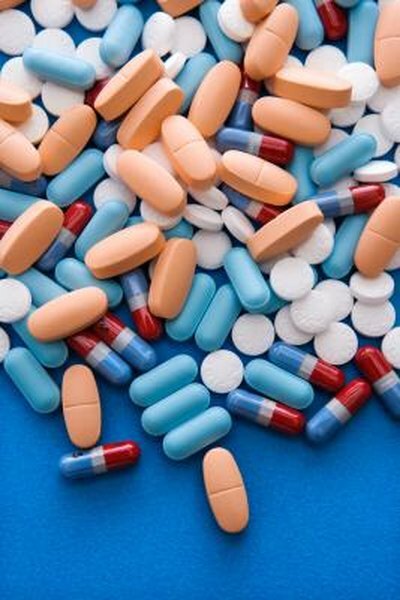 The most common side effects experienced while taking multivitamins are stomach upset or unpleasant taste in the mouth, according to Drugs.com. However, people who take multivitamins may also get headaches. Women who take prenatal vitamins may also experience headaches or constipation due to an increased iron level in these vitamins. Do not take more than the recommended dosage of your multivitamin supplement. Taking more vitamins than prescribed may result in hypervitaminosis. Hypervitaminosis, also known as vitamin poisoning, occurs when levels of vitamins, particularly in the fat-soluble vitamin group, have been ingested beyond the tolerable upper intake level. Hypervitaminosis can also occur with vitamin B-6 and when minerals such as calcium and iron are taken in excess. Hypervitaminosis causes symptoms such as stomach upset, severe headache, nausea, vomiting, muscle cramps and blood in the stool. If you've taken more than the recommended dosage, see a physician immediately.